Eleven pupils of the highschool of Marbach, close to Steinheim, who have been learning the Chinese language already for five years, were looking forward to a tree weeks trip to China in May 2018, to their partner schools in Tongling (province Anhui) and Yichang (province Hubei), including sightseeing in Shanghai and Beijing. Funding such a project is not easy for a school on a government budget, so the teachers were looking for additional sponsors. FLEX agreed to support this inter-cultural activity financially with a donation, which was highly appreciated by the pupils and their teachers. FLEX Management also invited them to visit CHERVON in Nanjing but unfortunately, it was not possible to implement this in their schedule for the trip 2018 – maybe next year! The students participated in the school life of their partner schools in Tongling and Yichang, which they enjoyed very much. But they were also amazed at the heavy workload of their Chinese fellow students. Together they spent time with sports activities like volleyball, table tennis, tennis and football and were offered lessons in language, music, dance, Chinese martial arts, paper-cutting and Chinese chess. The afternoons were filled with excursions, to the Three Gorges Dam in Yichang, in Tongling to the nature reserve for porpoises (species similar to dolphins) at Yangtse river. But it was particularly the Chinese hospitality that impressed the students the most. They left their host families loaded with presents and were determined to reciprocate during the return visit of their colleagues in July– but Chinese hospitality is hard to top! Sightseeing in Shanghai and Beijing was outstanding as well! Their program in Shanghai included the Bund, the traditional Yu garden, Peoples Square as well as Pudong and a visit of the Financial Tower. In Beijing, the pupils were staying overnight on the Great Wall, far from beaten tourist tracks. Furthermore, they visited Tiananmen, Summer Palace, Temple of Heaven, Coal Hill with a view to the Forbidden City and the shopping promenade Wangfujing. 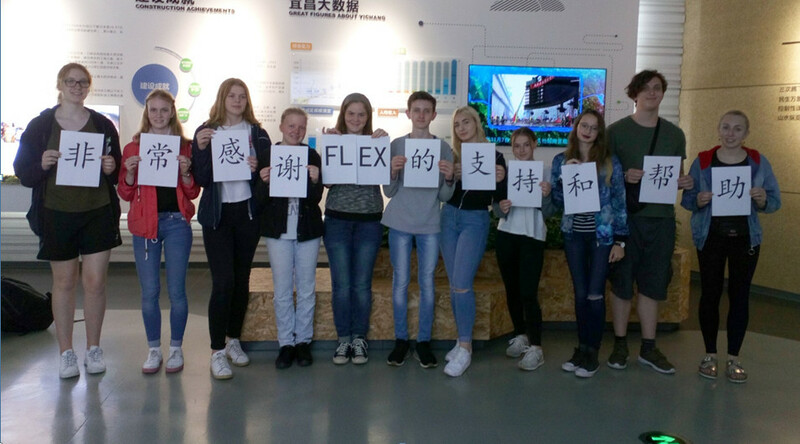 The visit has encouraged the students to pursue their Chinese studies and to follow up with Chinese society and culture.All participants thanked the company FLEX for their contribution to the success of this unforgettable adventure!